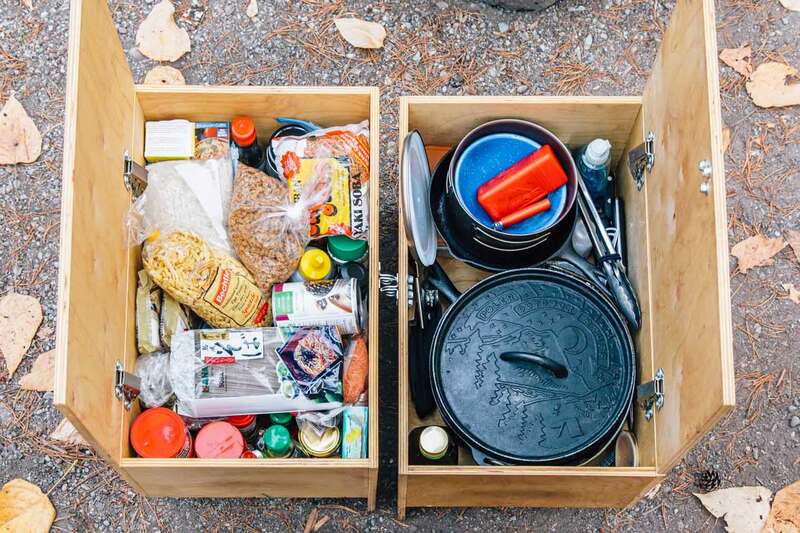 Just like at home, the purpose of a camping pantry is to allow you to create complete meals using non-perishable food items as a base. These pantry foods serve as building blocks, from which your favorite meals can be created. That’s why the pantry is so critical. Basically, all we need to do is pick up a few fresh items from the store and combine them with supplies from our pantry, and we’ve got a complete meal. We also have a couple of “break glass in case of emergency” meals that can be created entirely out of pantry items. The point is this: your pantry should be filled with food you will use and eat, not just carry around with you indefinitely. We’ve dutifully carried a bag of quinoa from Los Angeles to Canada and then back to Los Angeles before we revealed to each other that we actually hate quinoa. So then why did we have it? Because we felt we “should” because we saw it on some definitive list of must-own pantry items! 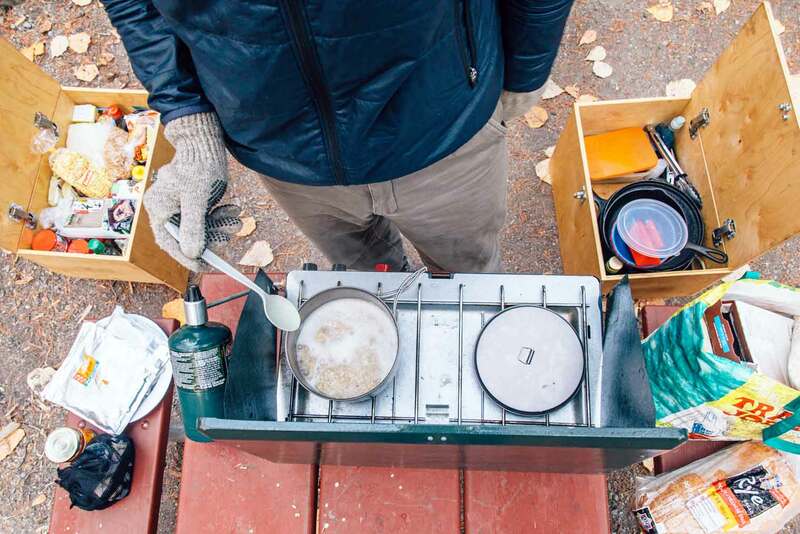 A good way to stock your camp kitchen pantry is to sit down and come up with a list of the meals you cook the most while camping. What is it that you find yourself craving more often than not? Come up with 5-10 meals that you know you love, that you’ve got memorized like the back of your hand, and then figure out which non-perishable items are needed to make them. That should give you a good base to work from. 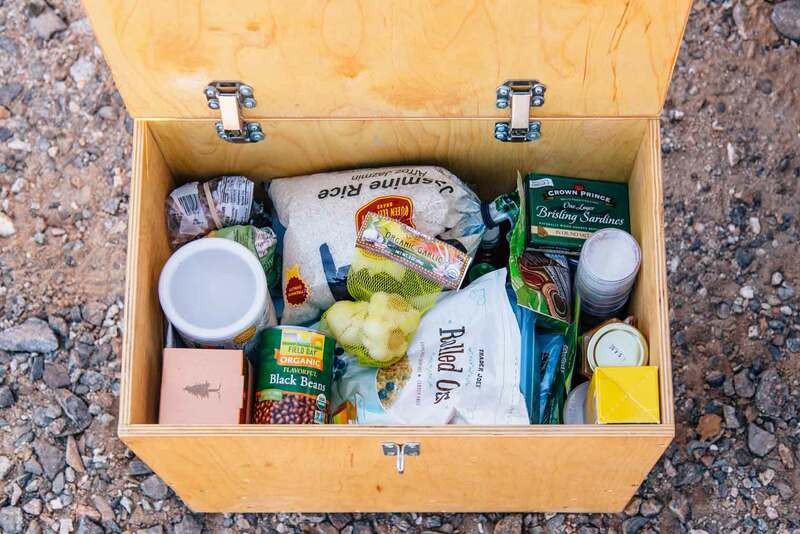 So again, here’s what we keep in our camp pantry and how we use all of it. Take a look and see if you get any ideas. Before we even get to the food, we’ve got to talk a little about finding the right container to house the pantry. We have custom-made wooden crates that fit perfectly inside our Ford Focus and double as a platform for our bed. Chances are you won’t need custom wood boxes, so here are few other ideas. Before we had our wooden crates, we used these heavy-duty plastic containers. They’re relatively cheap, yet surprisingly durable. We liked them because of the latching feature, top-down loading configuration, and rigid sides – which prevent items from getting crushed. While we haven’t used these personally, we have met some people on the road who keep their pantry items in one of these customizable organizers. They seem fairly durable and come with nice carrying handles. We haven’t used these for a pantry per se, but we have plenty of experience with them. Milk crates are great because they can be stacked on top of each other, you can see what’s on the bottom from the side, and they’re pretty cheap. Also, this particular model can be collapsed when not in use. Don’t want to bring the entire bottle of olive oil or just need a little bit of your favorite sauce? These Nalgene watertight containers are great for pre-portioning pantry items and come in a wide range of sizes. The screw top seal is the best we’ve used. So long as you close it tight, these things will not leak. This is our go-to cooking oil. It’s versatile and relatively healthy. We use it to cook, dip bread, and re-season our cast iron when we are on the go. ProTip: You don’t need extra virgin olive oil for cooking. Regular old olive is fine. Forget the PAM, this avocado oil spray is 100% chemical free. Sometimes it’s nice to have your cooking oil in spray form, like when grilling kebabs for instance or making some campfire popcorn. With a distinctive tropical flavor, coconut oil can be a nice alternative to olive oil in certain dishes, especially Indian and Thai dishes. Without refrigeration, traveling with butter is out of the question. Ghee – or clarified butter – offers a similar flavor profile to butter, but is shelf-stable and comes in a self-contained jar. Great for Mexican style meals or for making the beloved dirtbag classic: Rice & Beans. Great for Middle Eastern and Indian style meals. Also can be a nice addition to pasta dishes to add a little protein. Loaded with protein, red lentils are great for making curries and stews. These pastas are relatively fast cooking, which allows us to conserve fuel. They make a great base for nearly every Italitan style pasta dish imaginable. These pastas are also very quick cooking. They lend themselves very well to all sorts of Asian inspired noodle dishes. We recently tried this Trader Joe’s protein pasta that is made from lentils and it was great. No need for a meat sauce here, all the protein you need is already in the pasta! If we’re making a paella or curry dish, there just no substitute for white rice. But the brown rice is a healthier alternative. We didn’t know this until recently, but Minute rice is actually a pretty healthy form of rice, as it’s lowest on the Glycemic Index. The steaming process used to parboil the rice reduces the glycemic levels significantly. Plus it’s super fast to make. This is our go-to breakfast. Combined with other pantry items like seeds, nut butter, maple syrup. And if you’ve got some fresh fruit throw that in there too! This can be served as a sweet morning porridge or as a savory evening meal. 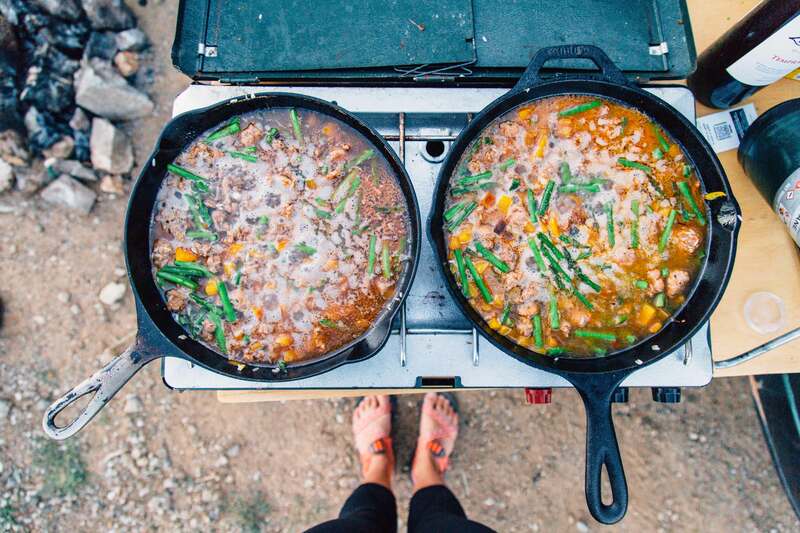 Paella is one of our favorite camp pantry meals: we always have rice, broth, and spices on hand – all we need to add are veggies & wine! 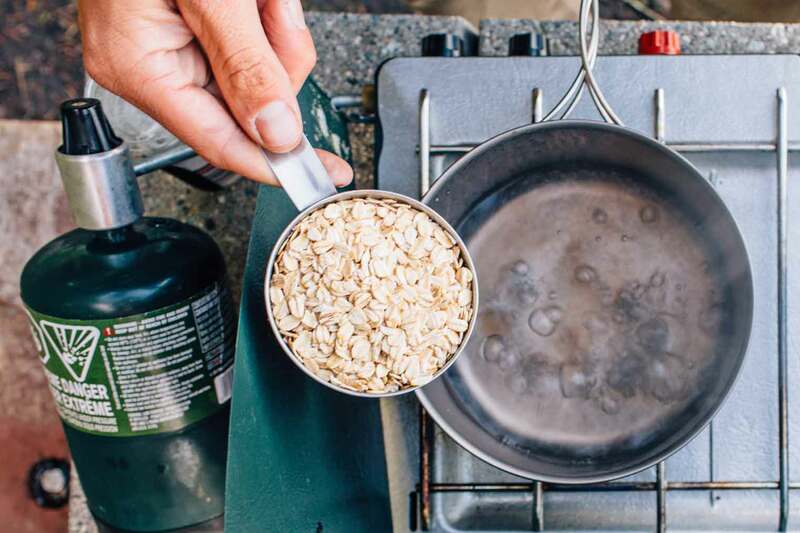 It can be hard to incorporate vegetables into your camping diet, but these dehydrated veggies can be easily added to rice, pasta, soups, and a variety of other meals. If we aren’t able to make it to a grocery store and we’ve used all our fresh produce, we are always grateful to have these on hand. They are also great for building backpacking meals! We usually carry canned tomatoes, green chiles, and sometimes artichoke hearts. With just a couple of canned vegetables on hand, you can dramatically increase the variety of meals you can create. Powdered eggs have gotten a lot better than they used to be. 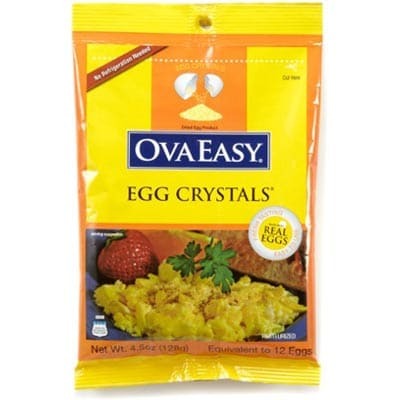 These freeze dried egg crystals by OvaEasy make excellent scramble eggs and are great to have one hand for a quick and easy breakfast. Heads and shoulders above canned tuna fish, not only are these tuna pouches from Wild Planet are shelf-stable by they taste great. Perfect for tuna sandwiches, tuna mac & cheese, or tuna salads. Salmon offers a nice bit of variety if you’re feeling a little burnt out on tuna. This canned Wild Planet salmon is the ONLY one we can find that doesn’t use a BPA can liner. Tinned sardines aren’t for everyone, but if you’re into them, they make excellent shelf-stable protein source. These Wild Plant sardines are the ONLY ones we can find that don’t use BPA in their can liner. They taste great on toast, mixed into pasta, or just on their own. For Asian dishes and breakfast scrambles, this shelf stable tofu is perfect. Great non-meat protein source that can be incorporatd into a lot of different types of meals. A great non-soy vegan protein. We’ve found this at natural foods stores and Whole Foods markets. Since we run a camp cooking blog, we actually roll with a full spice rack. Chances are you don’t need saffron, but here are some essentials that will provide a good amount of variety. This is a great vegan alternative to cheese (also doesn’t need to be refrigerated). We use this to make mac n “cheese”, potato hash browns, and a variety of other dishes that we want to have a cheesy quality. There are very few recipes we make that don’t call for a couple cloves of garlic. 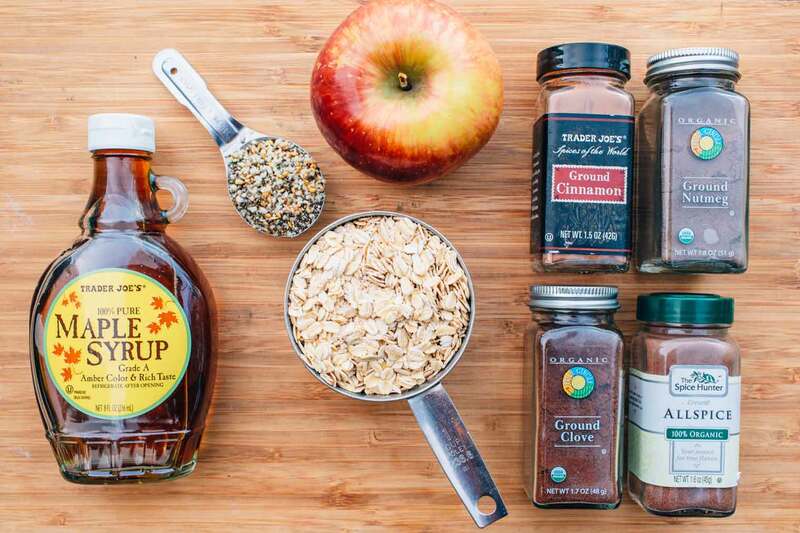 Great for pancakes, oatmeal, and even making cocktails. nother great sweetener that won’t go bad and can be used for just about anything. Take your pick or combine them all together. Seeds are a great way to add protein and texture to a meal. Adding a little coconut milk powder to our morning oatmeal keeps things interesting. A lot easier to deal with and lighter to carry than cans of stock. Pick up a few of these packets and just add water. When we’re looking for a special flavor in our oatmeal or want to kick up our curry game, coconut milk powder is great to have on hand. 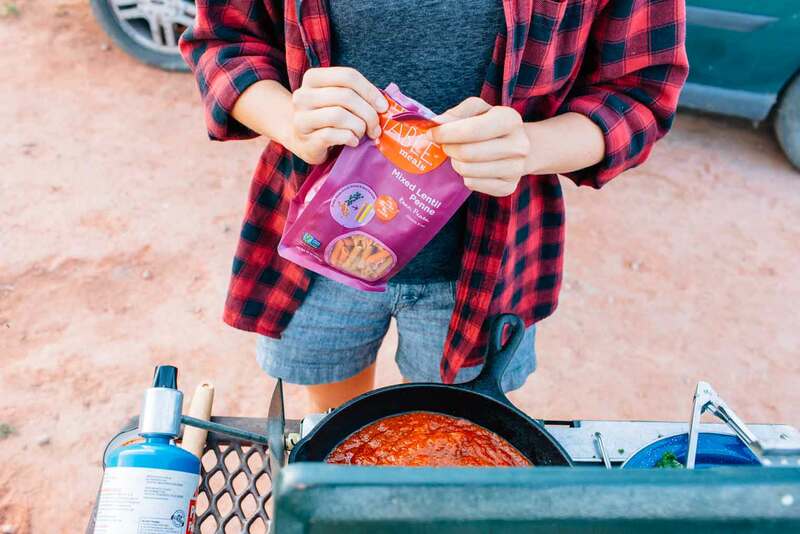 We’d love to hear about the camping pantry staples that you can’t live without and your favorite meals that use pantry items as building blocks! Did you make or purchase your wooden boxes? If you made them where did you find the plans? If you purchased them, who sells them? Love this post! My boyfriend and I are preparing for an extended cross-country road trip and we’re both huge foodies. This post and your blog has been perfect in helping me put together a packing list and inventory for us! Thank you for all of your insight and inspiration. That’s awesome! Have a great time on your road trip. Hope this list helps! Great post and super informative! 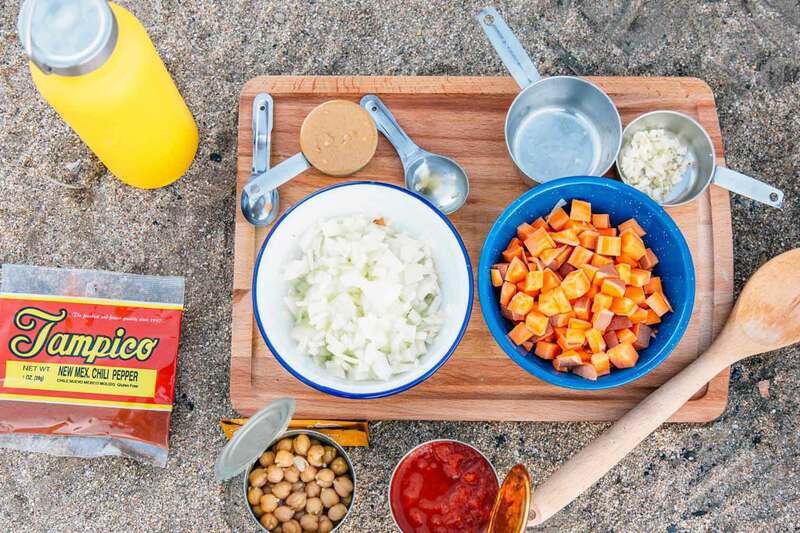 About to hit the road for a week of camping and I love your recipes – healthy and veg friendly. Keep up the good work. Just found your site. Love it. Have been a Dutch oven camp cook for many, many years. (Think fresh yeast cinnamon rolls in camp.) I just added a new item to my camp box–“the ringer, stainless steel cast iron cleaner.” It works great. Have one for each home and camp. Check it out. Thanks! Is this the one? http://amzn.to/2n2XfCj Definitely looks like something we should add to our kit as well. Thank you so much for sharing! Your story has inspired me to move out! I’m actually about to purcahse a focus today. 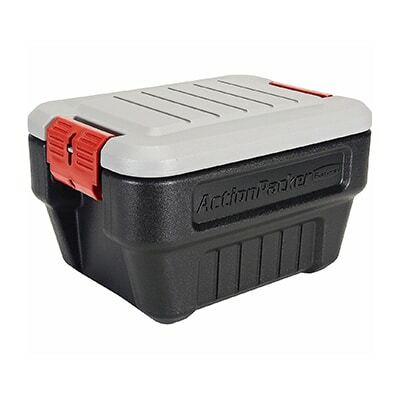 Which size cargo box do you guys use? Would you reccomend larger or smaller? Great post! Did you guys make that cool foldout table and the crates? If so, would you mind sharing the basic measurements and assembly? Also, what basic cookware do you carry in the pantry? Awesome post. I’ll be adding some of these to my camping list. If you haven’t already check out flavor God spices. They are amazing. Spicy blend is my favorite!!!!! Oo, thanks for the tip! We’re always looking for new spice blends – that is seriously the easiest way to switch up simple meals! Love. Love. Love this post! 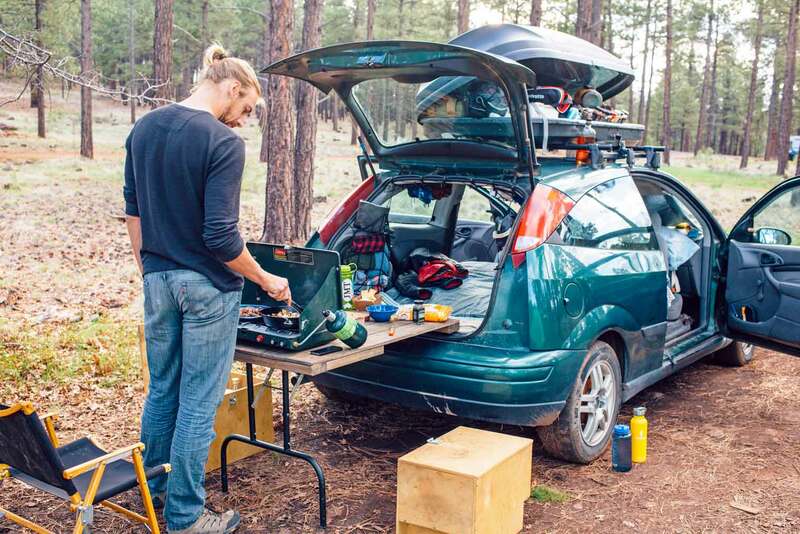 It’s super helpful in helping us plan what we ACTUALLY should be stocking in our hatchback’s pantry. I’m a big planner and would definitely try to stock more than we would actually need. And ghee!!!! That’s a brilliant idea…as a Southerner (hailing from deep South GA), butter is my go-to for so many things that I cook. I was already having separation anxiety thinking that we’d not be cooking with butter very often. Haha. Couple of questions… Do you typically purchase pantry staples online, specifically the coconut milk powder and the shelf-stable tofu? I know y’all are big Trader Joe’s fans; are you able to find these items in stores or are you forced to purchase online? Thanks! Glad you found it to be helpful! Ghee can be found at Whole Foods & Trader Joe’s. Coconut Milk powder can be tricky to find. We used to get it from a Indian market when we lived in LA (there were a few Asian grocers that carried it as well), but haven’t seen it many places since – so that’s one we’d pick up online. Shelf Stable Tofu we’ve seen in a few grocery stores (Whole Foods and some major chains in bigger cities) but it’s not everywhere. Since we’re a moving target, we typically try to avoid ordering online (shipping can be difficult to coordinate) and instead stock up when we’re in a town with a well stocked store. Some things are more expensive online than in store (especially basic pantry items – i.e. canned beans). But for the more speciality items, it might be worth ordering online rather than running all around town trying to find something specific.